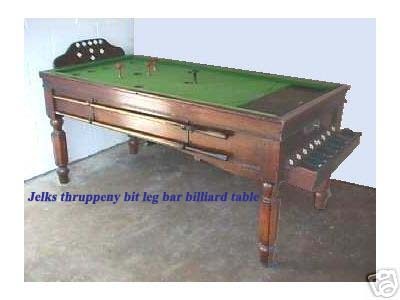 Riley, Jelques, jelkes, Supreme, Sams, Huxley, Mercury bar billiard table and kits, spares. 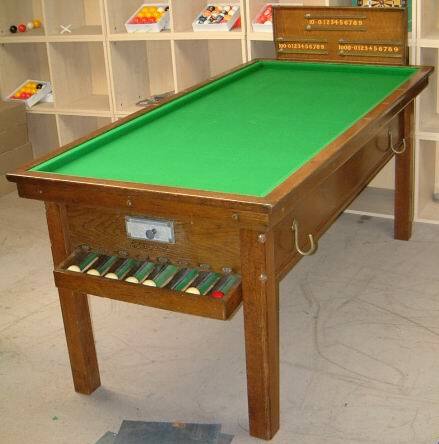 At MERCURY we not only rent out bar billiards, we restore them and sell them too! We always carry stock of new commercial/home tables. 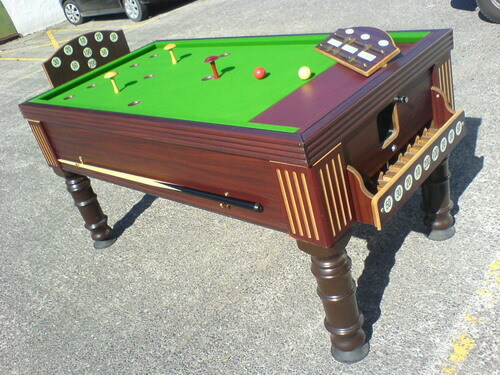 We have over 20 years experience in restoring bar billiard tables. 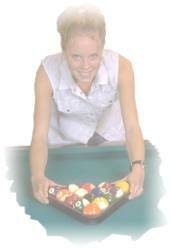 Whatever your looking for bar billiard related try us. Not all antique models in stock at all times, they come they go! We usually have about 10 in stock so please enquire. We show pictures of earlier projects for model reference. Bar Billiards. Not as common in pubs these days but still a fantastic game. Played from one end only so can be pushed almost right into a corner of your room. These are a great space saving design for the discerning cue sport player. Perfect for a range of locations. We normally have stock of refurbished tables and new tables. Most tables use a single slate . The older "antique" tables are made from solid Oak or mahogany and can have the original clockwork timer fitted, the newer tables being made from modern materials. all are covered with a high quality napped cloth and are supplied with balls and mushrooms. Please note, you will find cheaper tables for sale, many have cracked slates which will make the game impossible to play correctly, this can usually only be seen when the original cloth is removed. The original tables used a 12 mm slate which is very prone to this, they require very delicate transporting and hadling. 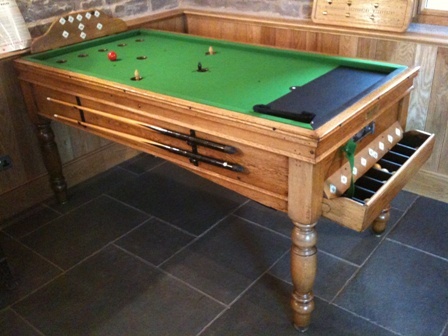 A bar billiards table requires considerable modification if a new slate is required. It would normally be replaced with a 19mm slate which is much stronger. We source tables from all over the UK. In our experience you can buy a cheap table from places like ebay but they will require a lot of time and money spent on them, usually requiring a minimum of new slate and cushions and woodworm / weevil eradication before use. Consider the costs involved before purchasing. 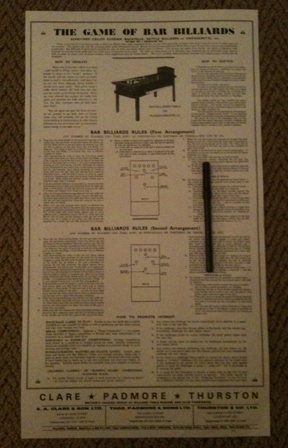 A tale of woe: We recently purchased an expensive table on ebay, advertised as totally original and excellent condition. result was a treacle varnished table with mdf offfcut bed which took 2 weeks to restore requiring new slate, cushions, woodwork repairs including complete dismantle and re gluing, staining, re lacquering etc etc. Sams tables were made in 2 sizes the narrow and very rare wide body. It also differed slightly by having the 30 and 10 transposed scores for rear holes compared to all other tables on the market. 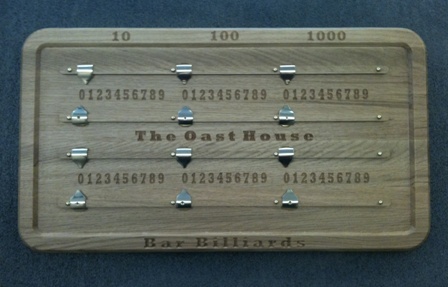 Each pocket hole has a score value, when the ball is potted it runs to the front of table for re placing and scoring. This table uses a clockwork timer and is made from mahogany throughout. This is an example of a reconditioned sams table pictured before delivery to our customer. 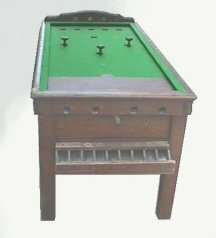 Riley bar billiards (previously restored, now sold, played by many enquirers at a guest house on the isle of lewis, Shetland)These tables are very hard to refurbish, cushion sets have to be newly made and original french clockwork timer is very hard to find or get spares for! A very early (approx 1920) thomas padmore table. Quite a rarity! Some more just in: newly refurbished! Ex demo model supreme. 19mm slate bed. Complete with accessories including balls, cues,scorer and rear marker board ,mushrooms, chalks. Very nice condition. 1 fingernail size scuff mark on top frame. Earlier model supreme/ avante/riley. (real wood leg) 19mm. 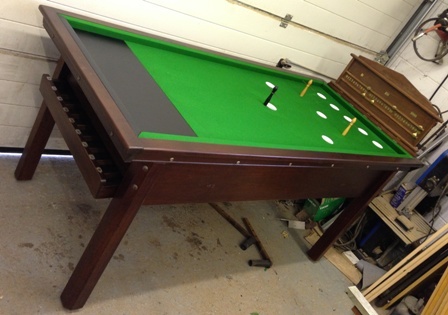 Complete with accessories including balls, cues,scorer and rear marker board( not shown on photo),mushrooms, chalks. Excellent condition. Ex display only. 1. 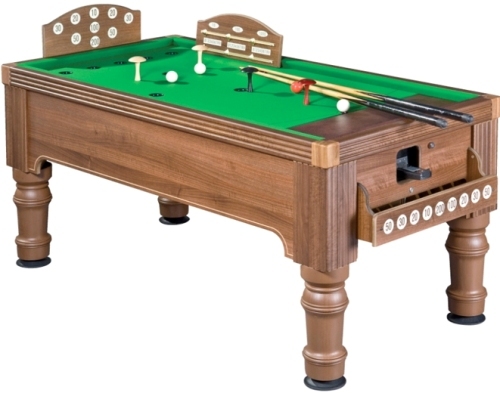 Sales of brand new commercial / home use bar billiard tables, eg The "supreme" and coming shortly our own reproduction solid oak table based on the "jelques"
3. Restored: This is the full service for "antique" tables. It includes cleaning, remanufacturing of operating parts and cosmetic parts if required. Re rubbering of cushions or in most cases making complete cushion rails. Checking slate for flatness,cracking, new slate cut and fitted if required, Eradicating any woodworm or moth larvae present. Rebuilding, Re staining and final burnish finishing, new cloth, accessories etc. final test and check before delivery. A restored table from us will still look old and totally in character with its age. We use the same materials as much as possible with the same techniques as the original manufacturers. We will undertake a full restoration of your table at our workshop only. Not cheap but the final product will please you! Please enquire. 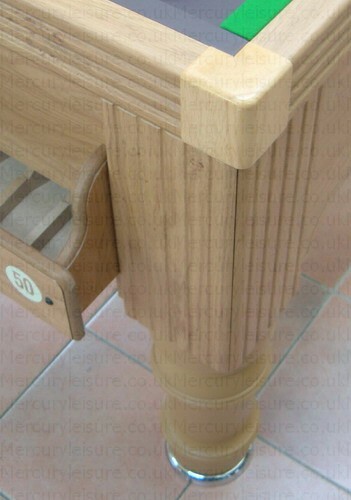 We have a full joinery available if your table requires parts made. See examples on spares section below. we stock seasoned white oak, red oak, cherry and reclaimed mahogany. Brand new SUPREME bar billiards as shown above. 19mm slate bed, "straight" coin mechanism with easy price of play change, electronic timer for fast switchable game time setting. Superb build quality from modern materials. Superb for long life commercial use. Obviously great for home use too! 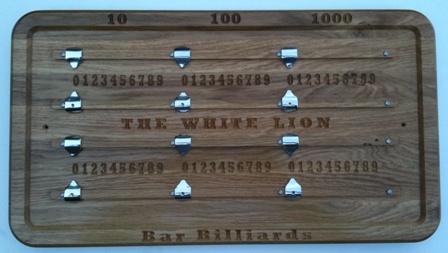 Supplied with 4 cues, ball set,rule sheet, mushrooms and scorer. This is our recommended table for heavy commercial use. All spares for this table from stock! 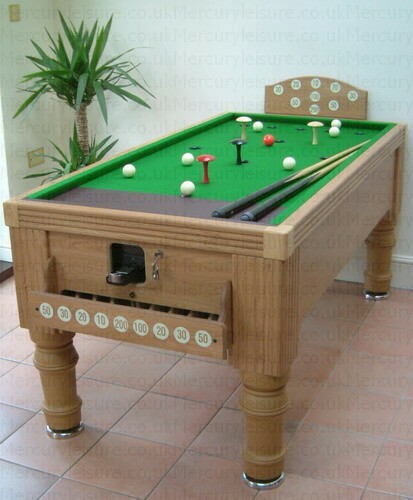 I am writing to let you know how very pleased we all are with our new Supreme Bar Billiards table; the workmanship and standards of finishing are most impressive. Assembly was just as easy as you had promised, aided by your very clear instructions. I and my sons are enjoying this highly skilled game – I never understand why every pub doesn’t have one. Thank you once again for providing such an excellent customer service. I am very impressed, and will happily recommend your Company to anyone. 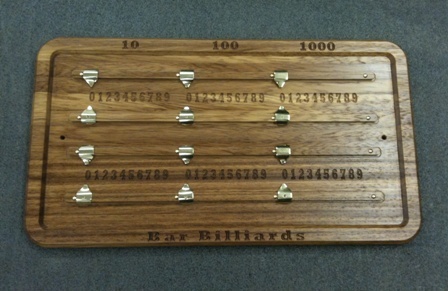 We also stock spares for bar billiard tables including ball sets, lighting,cues,mushrooms, skittles, cloth,pocket rings, coin mechanisms and timer assemblies. replacement slate for sams, padmore, riley etc. P.o.a and as available. Cut to order only. 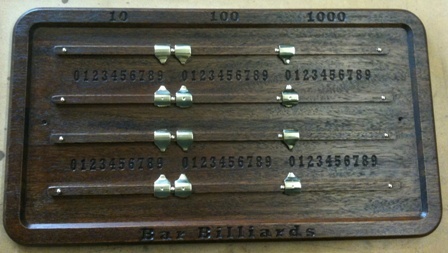 Reproduction bar billiard cue rests. Steel, black or brassed finish £40 set of 4. 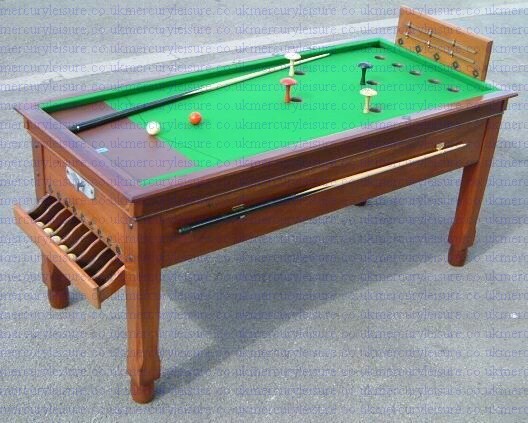 Bar billiard cloth bed and cushions £88 napped top quality green baise. Carved from solid 22mm oak in one piece including the slider rails. 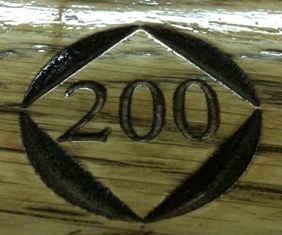 All numerals carved deep into the wood too. We make these... not available anywhere else! scores to 9999 if your a good enough player! Carved from solid oak / iroko / Reclaimed Mahogany in one piece including the slider rails. All numerals carved deep into the wood too. Joinery jointed to avoid warpage. Colouring may vary slightly as oak / iroko are natural products. Finished in clear satin so You can see the beauty of the wood. Add £10 if you want your name or pub name etc carved in too. Solid Oak with chrome. Carved for "The White Lion "
Available in mahogany or oak, natural or antiqued. Original clockwork timer/mechanism refurbished. very expensive & very hard to find elsewhere! £300 (doesn't fit some riley tables without modifications to table) shown below before restoration for size reference only. Meter unit is an add on and not included. Export: We are happy to pack and palletize for you to arrange collection from us using a freight forwarder. We have shipped tables as far as Usa, Australia, Spain, Portugal, France, Turkey etc. Please ask for packed dimensions and weights. 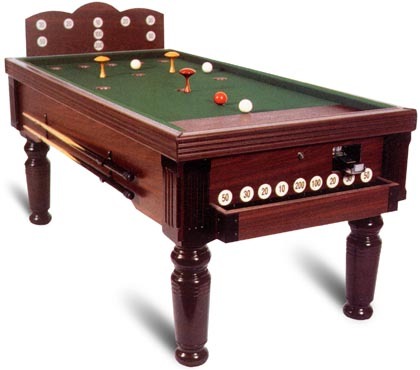 Bar billiards is played on a special table without side and corner pockets unlike a pool table, but instead has 9 holes in the playing surface which are assigned certain point values (from 10 to 200). There are 8 balls for play - one red and seven white. Potting the red ball in any hole scores double points. 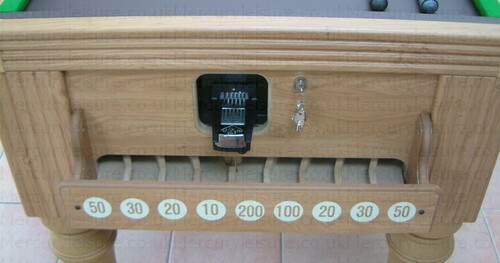 On the playfield are normally placed three pegs (4 pegs are supplied with tables but the 4th is rarely used) two white pegs or mushrooms just behind the two '50' holes, and one black peg in front of the '200' front hole. If a white peg is knocked over then the player's turn is ended and all score made during that turn is lost. Knocking down the black peg ends the player's turn and all points scored from the start of the game are lost. In the case that a white and a black peg are both knocked over, then only the rule for the first peg to be knocked over is used. 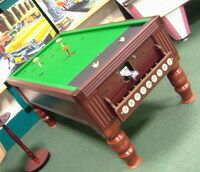 All shots are played from one end of the table so access to all sides of the table is not required. A white ball is placed on a starting spot, then another ball (the red ball, if available) will be placed on a spot a few inches in front of that. The player usually aims to get one ball in each of the 50 score side holes, this can only be done a maximum of three times, if both balls fall down the 50 holes for a fourth time then all points from that turn are lost. As a result of this, the player usually tries to keep one ball up, and is often referred to as the 'one up shot'. The player then tries to pot this ball, if both balls are potted then two balls are put back on the spots. If the player fails to pot a ball then the turn has ended and the second player takes his turn by placing another ball on the first spot. If all balls are in play, then the closest ball to the 'D' (the semi-circle around the first spot) is removed and put on the spot. If a player fails to hit a ball, then the turn ends and all points earned in that turn are lost. Why is it called bar billiards? The play is time-limited (normally 15-17 minutes of play). 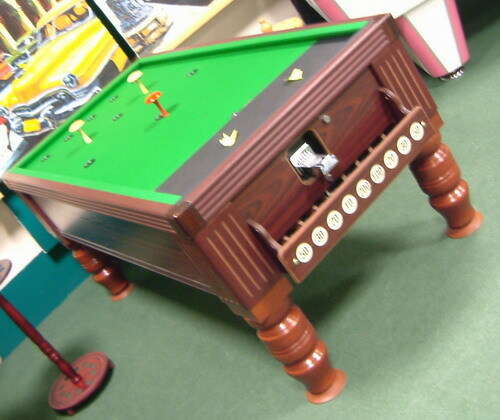 After this time a bar drops inside the table stopping any potted balls from returning, leading to a steady decrease in the number of balls in play. The last ball can only be potted by getting it into the '100' or '200' point hole after bouncing off a side cushion. 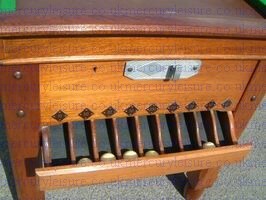 For this last shot the pegs or mushrooms are placed in the 50 score holes to block them. The game can still be decided here if the black skittle in front of the 200 hole is knocked over with the unlucky player losing all of his score! Rules played differ by county slightly. A complete rule set is supplied with all tables we supply. Where can i play bar billiards? if you have a bar billiard table in your local pub please email us and let us know. We will try to list any location in the uk and jersey.Please send info of pub name, address, county, contact number and email /website as available. Help make us the number 1 for bar billiards info in the uk.